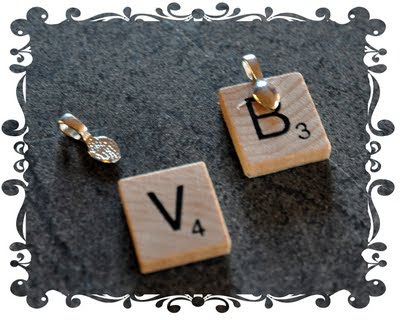 I have been playing with my scrabble tiles and came up with a new way to make my scrabble tile charms that I thought that I'd share with you. I've been making these for a while using premade "glaze drops" but I have figured out a way to make them without the glaze drops and I'm equally as happy with the final results. Here's what you will need to make these scrabble charms ... scrabble tiles, bails, diamond glaze (i.e. Inkssentials glossy accents), a strong adhesive (i.e. E-6000), small xacto knife, self healing cutting board, small emery board, pencil, clear piece of acetate and a picture. 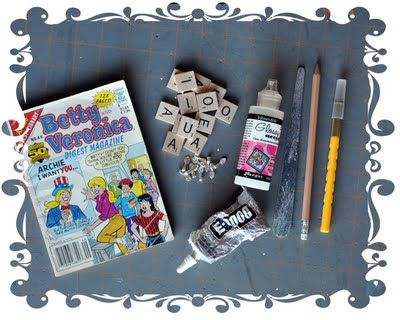 I decided to use some of my old Archie comic books for this tutorial. 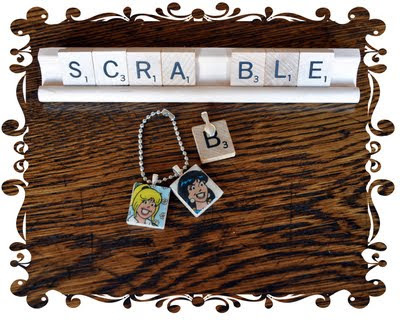 You can use small photographs or anything paper/art that is small enough to fit on the scrabble tile. Step 1. Trace around a scrabble tile on a piece of acetate. 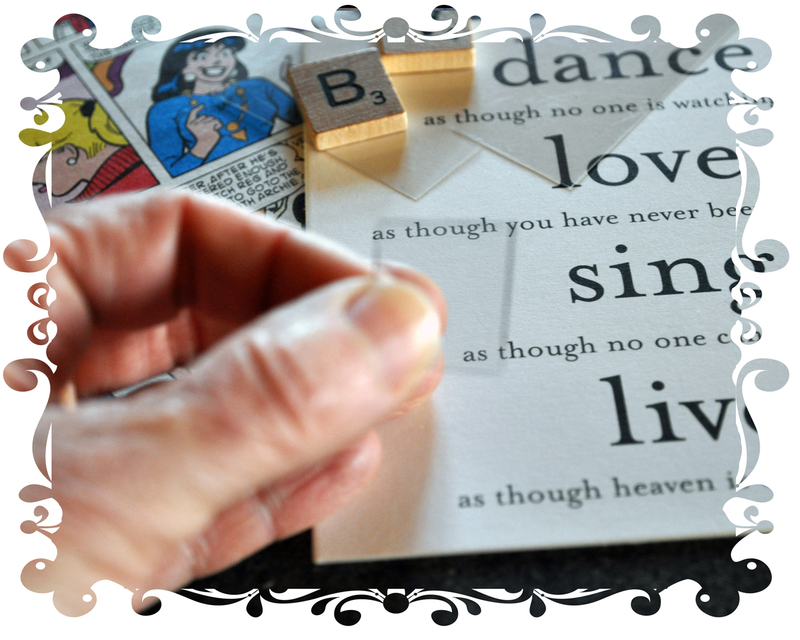 Cut the acetate with your xacto knife so that you have the exact template of the scrabble tile. I used a permanent black marker to go around the edges of the acetate template ... it is small and easy to "lose" when you are working. Step 2. 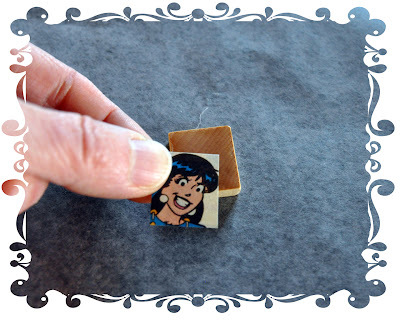 Next you will use the acetate template to figure out where you want to crop your picture. Once you are happy with the image, trace around the template with a pencil and cut out with an xacto knife on your self healing mat. 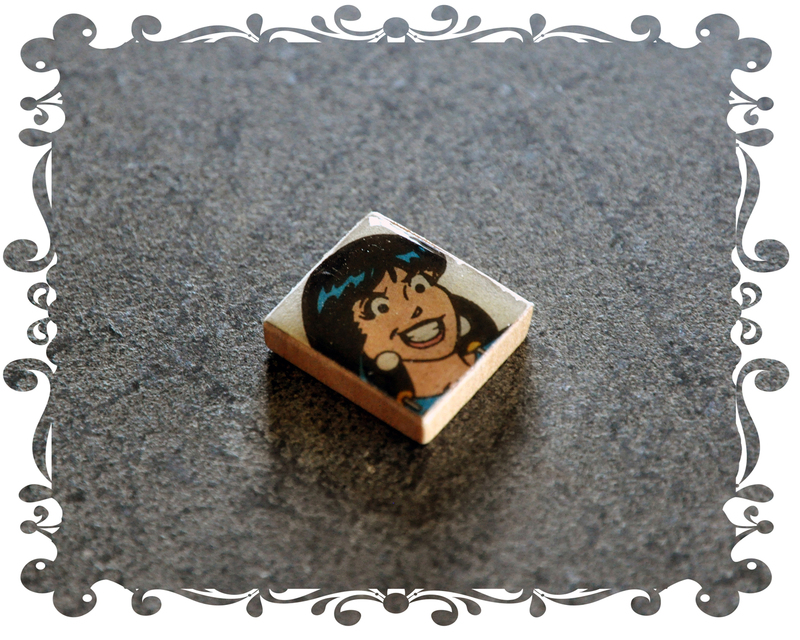 ... spread the diamond glaze around on the back of the tile so that it covers that back entirely but does not go over the sides. 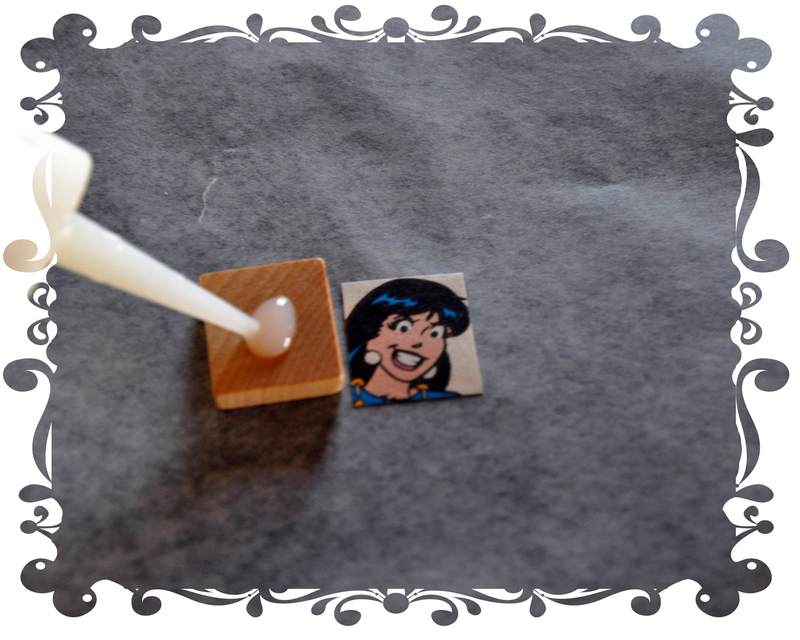 You don't need a lot of diamond glaze for this part ... just a thin layer. Then place your picture on top of the glaze, press down and wipe off any diamond glaze off the edges (if any comes out). Allow this to dry for about a half an hour. Step 4. 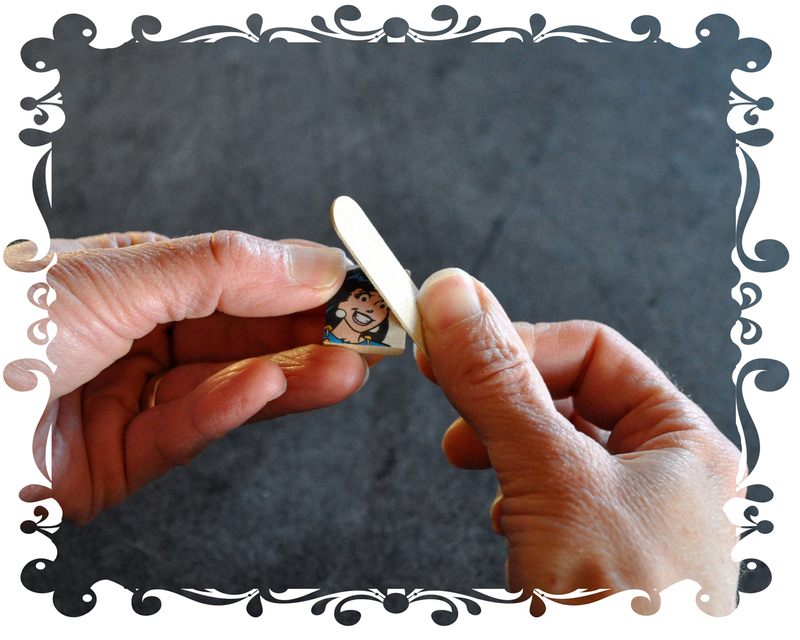 If your picture is a little larger than your scrabble tile don't worry because this step will straighten that out. Using an emery board, you will lightly sand (with small downward strokes) the four edges of the tile to remove any excess paper. ... trust me ... many hours. If you touch it to see if it is dry and it isn't ... don't worry about that mark that you just made. 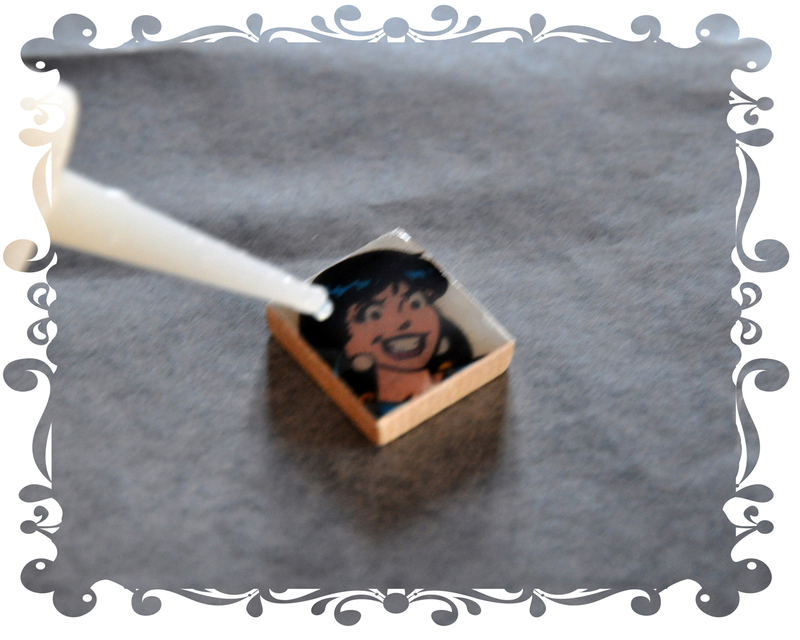 Once the glaze is completely dry, you can apply another thin layer of glaze to the entire image and that will cover up the finger print! Step 6. 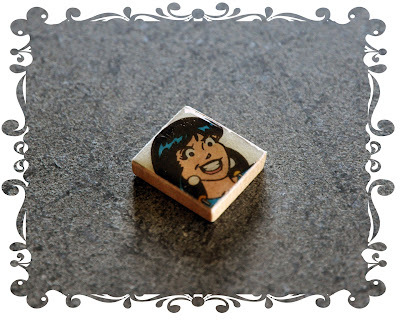 Now we just need to attach a bail to the back of the scrabble tile if you want to use this tile for a necklace, bracelet or earrings. Using a strong adhesive such as E-6000, attach the bail to the top of the scrabble tile and allow it to dry according to the directions on the package. And now you are done! 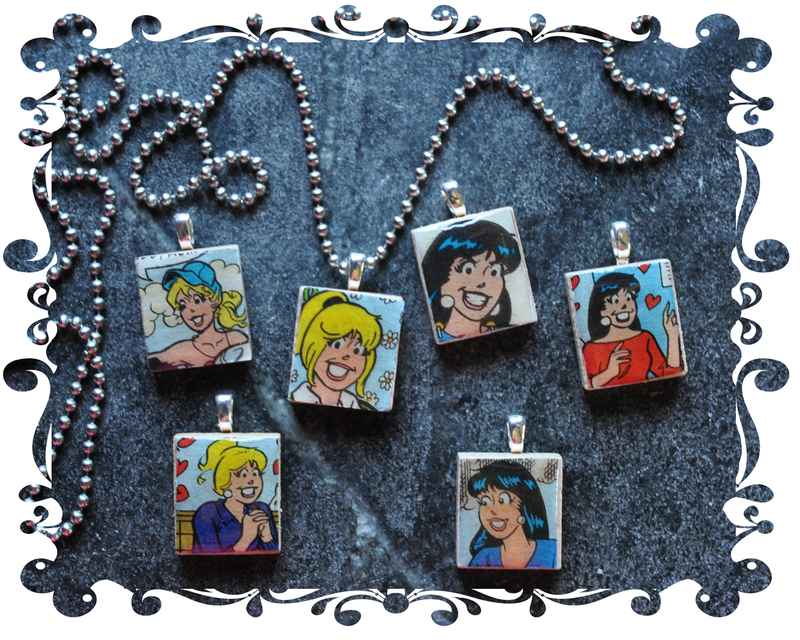 Here's a few of my charms for girls that want to be Betty or Veronica ... 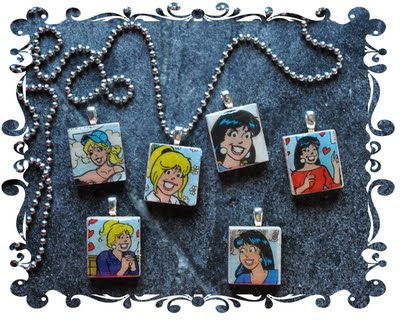 I always wanted to be Betty! I think that I'm going to make a charm bracelet with the whole gang. I have made these scrabble tiles with photographs, digial art, maps and books and I'm sure that there are lots of other good ideas out there for finding images to use on these scrabble tiles. These are great to make with the kids too ... depending on how young they are you may have to do the cutting steps with scissors instead of the xacto knife. 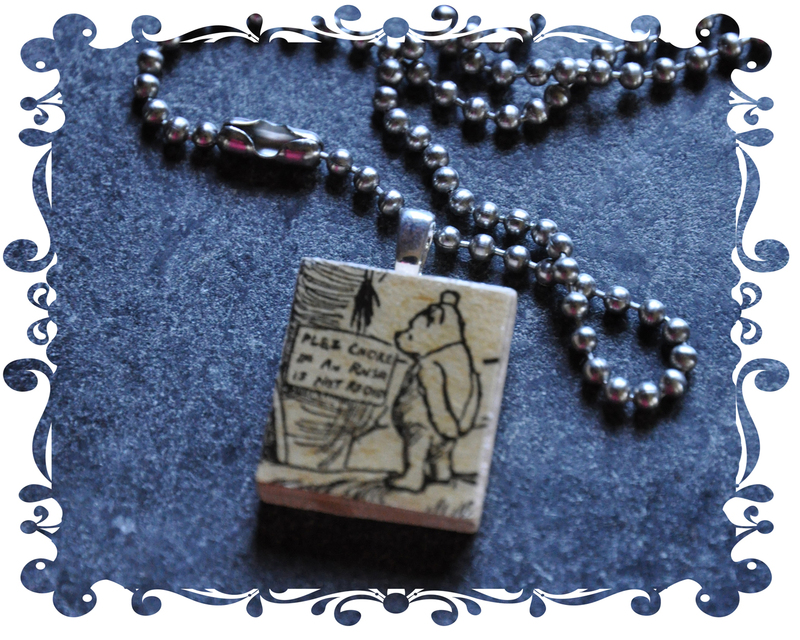 I hope that you enjoyed this tutorial and are tempted to make one or two for yourself. yay!!!!! the girls and i are MAN FREE on the long weekend and i think we are going to make these!!! woohoo!! thanx for the instructions! What a great idea...and helpful tutorial! yay! love the tutorial! 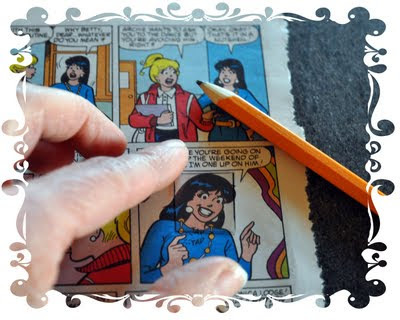 I had been thinking about doing these...by the way, I always wanted to be Betty, too...I never could understand how Archie could be so easily manipulated by Veronica! (Yes, I had a stack of Archie comics, too!). A charm bracelet of all the gang would be awesome! these are clever and beautiful! Coming over from Studio JRU. and I think we were fellow flyers! Thanks for the tutorial - great job describing and the pictures are excellent! I stopped over from the Answer is Chocolate BFF Link Party where I've linked up too... pop on over if you get a chance. Oh Lorrie these are fantastic ( and a stroll down memory lane of Archie comics!) Thanks so much for linking up at this week's BFF party!